IT 'S ALL DONE WITH MIRRORS ? I just knew that we had not heard the last of my dear chum 'Old Bill Martin' he has come up with a wheeze that would have been applauded by the great 'Arthur Daly' remember " Terence my son, hitting old ladies over the head with a half brick is a crime, everything else is just business " listen up, here's the cunning plan, Old Bill, he of the perfectly coiffured hair ( some cruel opponents maintain it's an Irish Jig ) and the smile like the tin plate on a coffin will resign, i.e. take the 30 pieces of silver and concentrate on ironing people's smalls while his fragrant wife Caroline will stand for election in his place. Thus will a lump sum ( £20,000 )? be secured and the remuneration from the council be maintained, can the SNP afford to lose a man of such initiative ? surely not. Can sweet Caroline win the seat? will the people of Glenburn stand for it? anyone who has met her or seen her at council meetings could not help but be won over by her, the perfect manners, the friendly smile, the sweet disposition and the recent ringing endorsement from the Standards Commission ( look it up ) must surely stand her in good stead. Surely it's the SNP's loss ! Old Bill, Sweet Caroline and of course the Boay Vassie are now the keepers of the independence flame while the Faint hearts led by the Boay Mackay have deserted the cause, poor bonnie Scotland, broken and abandoned by the SNP fearties, you would need to have a heart of stone not to laugh. The above is a site which comments on other blogs, they seemed in the past to be harmless enough, if a bit pedestrian. Unfortunately I'm writing this on my blog because I'm on my own and have no computer expertise/back up and I couldn't figure out how to reply to what they have been saying about me. I sometimes check who has visited my site and see what they have been commenting on, mostly it's predictable right wing/nationalist drivel with a few exceptions, some of the exceptions are in fact right wing, but as yet no nationalists. Anyway I have no problem with that, there is however a pattern emerging which shows a hint of collusion which emerges when several of them accuse me of stifling debate and cutting out comments. I have tried to explain before that I will try to print comments if they are not abusive, in the past couple of weeks I have only removed three of these and printed everything else, no matter how puerile. This site seems to have joined in with these liars and is now, as far as I'm concerned not to be trusted, how easy is it to accuse me of this? they have nationalist stamped all over them, perhaps the site will put the record straight but I won't hold my breath. I intend to print everything that's printable. Why wouldn't I when so much much of it makes my case for me. To those foul mouthed racists, bullies and anonymous cowards who have, for some time been sending me and my family abusive, racist and sinister letters, emails and blog comments I say, as the new year approaches, crawl back under whichever rock you came out from, I would dearly like to meet some of you face to face, eye to eye kind of thing. Anyway for the rest of you, for and against me, best wishes, as in 'peace on earth ' etc. and remember we are almost one more year closer to seeing the red flame of Justice, Peace and Socialism. 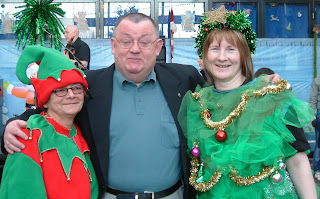 Tannahill Centre Ferguslie Park, Saturday 12.30 this is me and chief Elf Margaret Canning with the well known Christmas tree Maggie McCulloch ( a thorn between two roses ) the picture below is Wendy Alexander doing the count down to the switch on, she's having more fun than the weans. We are all waiting for that other big guy with the beard, not Fidel this time but Santa, the atmosphere is such that you could throw your hat in the air and it would stay up there. A team of Elfs ( some wag called them 'the national Elf service' ) + fairies and folk dressed as Xmas trees seem to be everywhere, he arrives, not in a sleigh, but in a beautiful vintage car, as he exits I mention that I was not aware that Santa had heavily tatooed arms, cue bedlam. My friend and comrade, local MSP Wendy was there with her lovely twins and equally lovely husband Brian, Wendy and I then done a local radio interview and were questioned by two smart young girls, it really was happy chaos, stalls selling everything and anything and a band blasting away, it was like 'the old bazzar in Cairo' a great start to Christmas. Meanwhile our Prime Minister is in the Holy Land trying 2,000 yrs on to bring about 'peace on earth' no pressure there then. Jesus Mary and Joseph were Palestinians, what a thought, all this time and instead of the Romans in occupation we now have the Israelis and the innocents are still being slaughtered, the Roman occupiers used torture and crucifixion while today the Israelis use torture and tanks. I hope everyone's God is watching, peace in Palestine ? wouldn't that be a great start. A FRESH CIGAR COMMANDANTE ? The Bay of Pigs, exploding cigars, exploding pens and much more, yet the big guy with the beard is still standing, or, perhaps lying in his sick bed but, gloriously, still with us and still defiant. America looks across at the audacious Cubans and their indomitable leader Fidel with hatred and not a little envy, what a contrast, the draft dodging coward Bush who arrived just recently in Vietnam 35 yrs. late and Castro who has fought with hand and heart for his people since 1959 when the American puppet Batista was deposed. Back then Cuba was the playground of the CIA and their bought politicians, mafia crooks also held sway and every perversion known to man was available against a backdrop of grinding poverty and oppression for ordinary Cubans. Now the richest country on the planet ( America ) lags behind it's tiny enemy Cuba in health care ( more doctors per head, and free ) better infant mortality and better education standards, so, what else has Castro ever done for us ? Compare him also with the reviled Pinochet who died a blood soaked crook and puppet of the CIA who murdered and tortured thousands, he stole millions from the people and lived the life of Reilly feted by the likes of the wretched Thatchers ( Britains shame ) Castro is accused of having millions, so if that's true he's left it late to live it up, 60 yrs of struggle 7/24/365 mostly wearing battle fatigues, while Pinochet strolled around London and New York, who do you believe ? Latin America is fighting back against the American gangsters thanks in no small measure to El Commandante Fidel, a great man. The huge number of inadequates in Scotland are at it still, they now want the Golden Eagle to be Scotland's national bird, poor creature, what did it do to deserve that ? why not the starling ? While we are at it who decided on Flower of Scotland as a national anthem ? what's wrong with 'Stop yer Ticklin Jock' imagine a large crowd, shoulders moving together to 'tickalickalickalin, stop yer ticklin Jock' national dress ? the kilt, says who ? 'going cheap at £600, haggis or Ruby Murray ? I go for the latter. St. Andrew, eh ? blue n white flag ? chosen by whom ? national poet Burns ( 2nd rate plagiarist ) who picked that lot ? My god it's absolute rubbish eh ! but at least it's Scottish rubbish. If you want a glimpse of Scotland under the SNP look at the Glasgow Herald's letters page, think of Salmond ( all time holder of most lost elections and still leader ) in his see you Jimmy Wig and be afraid, be very afraid, Scots who need this drivel are in a bad way. DEC. 13 TH. 06 I forgot about the national drink whiskey, as in 'freedom and whiskey gang thegither' If Burns was copying people and crawling to the upper classes today, he would have to relegate whiskey to somewhere way behind Irn Bru and Buckfast. Labour have held Elderslie with a greatly reduced majority, despite all the squalid SNP ( who stand for nothing ) bragging they have failed again. The Gnats stank the place out again with their tactics and for that reason alone they deserved to lose, they are quite shameful and can't see a belt without trying to hit below it, they bring shame on Scots everywhere. So we have sent them homeward to stink again. Oh and the SSP, or was it Solidarity ( it's confusing when thieves fall out ) got 50 votes, the revolution isn't quite here yet it seems. The reviled Tories ( who stand for something ) beat the awful Lib. Dems. ( who stand for nothing ) but most importantly we won and youse didnae ! This item is over - I've given it a good run, I received a comment from someone who suggested that Pinochet was preferable to Allende, I think that's enough. Mr. Hutchison of the SNP insists that the SNP are not anti English, that's surely enough of that as well. Our old friend rightforscotland remains convinced of the benefits of a flat tax he is consistent but wrong and our exchange has seen us both moderating our language, I must be getting old, he does however promote the most awful, squalid blogs, stuff to make your skin crawl, that worries me. Anyway as this is the last comment on this subject I will say again. I believe that the rich should pay more than the poor that means a larger percentage of their income should go in tax, I think that that, makes us more civilised, the end.